In which we take 2 steps where no one has gone before, 1 step back to the future. I don’t hate a lot of movies. I’m disappointed in more than my fair share, but very very few illicit my full-view hate and rage. Two movies in recent memory have achieved this illaudable goal: Man of Steel and Star Trek Into Darkness. These are movies that just thinking about causes bile to back up in my throat, and despite my best efforts to purge them from my memory are etched into my mind. Darkness was so bad I declared, on this very site, that it had caused me to completely lose faith and interest in Star Trek, a franchise that for a good chunk of my childhood was of singular importance. While my attention to the franchise has waned significantly since my adolescence, something you spend that much time with remains a part of you forever. Darkness killed the last of what had remained. Or so I had thought. Beyond, apparently, has resuscitated the last lingering threads of adoration. Beyond is not a perfect movie. But it excels in every way that its immediate predecessor (which quickly joined The Final Frontier as the only Trek films fans pretend simply never happened) failed. It took what was interesting and exciting about the reboot, and advanced on those promises. I’ll be damned if I didn’t enjoy the film from five minutes past the start to the end. 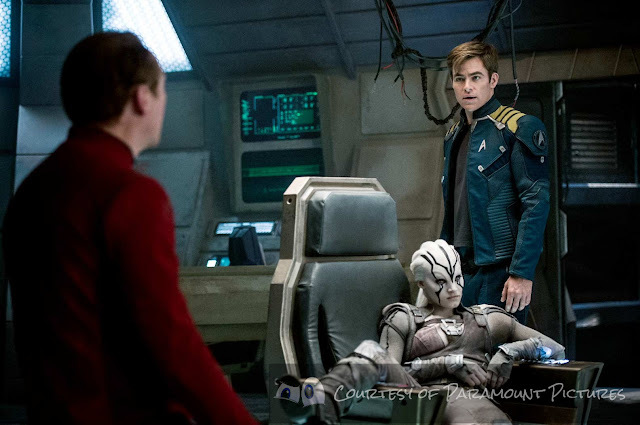 As a summer blockbuster, filled with the requisite superfluous fistfights and overbearing CGI and barely there villainy, Star Trek Beyond sits comfortably higher on the heap than most. As a movie of substance and lasting influence, it slips down the heap considerably. But at least it has the tenacity to ask a philosophical question, even if it is a basic one. That’s more than Ghostbusters or Mike and Dave attempted. The film finds Kirk and the Enterprise world worn. A little over three years into their five year mission (note, the original series lasted only three seasons – the first of many subtle and unsubtle jabs at yesteryear), and everything is at the end of it’s rope. The ship is running low on supplies, and the crew is running low on coping mechanisms. Back, after the first of the reboot films landed, in discussing sequels it was proposed that Space itself would be an adversary, and this film actually picks up on that premise. The Enterprise has spent years boldy going, but the going is starting to look the same. Space, in the end, is always just more black, and Kirk is beginning to doubt the effectiveness or point to the mission. When things begin “feeling episodic” (see what I mean, subtle and unsubtle), when the only consolation can be found in unfeeling fraternization and drinking, and when the years start piling up like cord wood, you start asking “what is the point of all this?” And that’s an honest, universal, interesting question. And then a space lizard shows up and blows up the ship. I’d warn for spoilers, but that much was in the trailer, and it closes out the first act. But even the space lizard brings with it another interesting question, if slightly less universal. What is the Federation? What is the point of it? Is it a few affluent races pushing their agenda on the galaxy? Is it really a universal peace? Is it a showcase so it’s people can hide their weakness behind its flag? The film takes the easiest position: Krall (Idris Elba) represents the man against the whole, the individual is stronger than the group, and to each their own. Kirk and his crew stand in for the Federation representing strength in numbers, survival through unity, and survival through cooperation. There are deeper questions that could be asked, about colonialization and globalization and the loss of cultural identity in favour of a melting pot, but this is a popcorn movie and we should be grateful that it’s asking a question at all instead of just punching things near explosions. There is also punching things near explosions. I’m going to credit Simon Pegg’s duties on the script for a lot of what makes the film work. First, he’s a respectful fan, not a slobbering one. His reference work feels more like someone who knows what they’re talking about and how the world works rather than a fan-fic writer trying to cram in as many shout-outs to as many wiki articles as he can. And he knows how to plot a narrative, and how to keep things moving from A to B to C using characters rather than set pieces. The fact that Bones and Chekov are actual characters in this film is a testament to the fact that Pegg is aware that the crew is comprised of more than just Kirk and Spock. In fact, Spock is downgraded significantly in this film, and kept apart from Kirk through much of the run time, wisely paired with Karl Urban’s McCoy (Urban and Quinto have far more chemistry than Pine and Quinto. Pine is, again very knowingly, paired better with Pegg). It makes me so happy to see Bones not only given something to do, but once again elevated to his position of equal, and soul of the trio. I’d say that Uhura and Sulu get the short end this time around, used entirely as exposition dumps, and whose scenes require their presence in only the most basic technical manner. Director Justin Lin deserves a lot of credit too, if only for brining a distinct visual feel to the franchise. The behind the camera work has never been a place of innovation for Trek, with ships passing in three-quarter positions from left to right, and everything else very still. Lin uses a lot of angles, and a lot of unusual positions for both his physical shots and the CG. Seeing the ship at warp from within the warp field, or the camera mounted on the ship while at speed instead of a third person perspective give the film texture. The only fault in all this is that Lin’s camera rarely stops moving, and shakes particularly badly during his action sequences, making it next to impossible to make out what is going on. During fight scenes, it’s easier just to go cross-eyed and assume whomever stands up at the end was the winner. Lin’s visualization of the film at least shows that Trek can survive and thrive with change, and deserves more experimentation in the future. This is why I constantly advocate different creative teams in franchise instalments, because new blood brings new perspectives and innovations, while returning teams tend to stagnate in old habits. As for what doesn’t work… there is still a struggle with tone in this new franchise. In attempting to make the films accessible to a wider audience, they’ve cast a broad and varied net with the humour, and not all of it lands. Trek has always been funny, but it’s the kind of funny on display when Bones and Spock verbally spar with one another (I cannot overstress how wonderful the Bones/Spock scenes in this film are), or when aliens misunderstand human behaviour. What doesn’t work is the goofy stuff, like the puffy hands in the first one, or the full first five minutes of this film. This movie opens rough, with these weird angry ceratops aliens that set entirely the wrong tone to start off. I literally sank into my seat and girded myself for two more wasted hours. But as soon as Kirk was back on the ship and deep in his funk, the movie really steps up. But occasionally falls back on the goofy stuff, or stuff that makes no damned sense whatsoever – avoiding spoilers, but I am very unclear how a Beastie Boys song accomplishes what it does, based on the technobabble everyone was spouting in the scene previous. As I mentioned, Sulu and Uhura are downgraded to third tier info-dump characters, to make space for Chekov to actually get something to do (besides every non-human lady crew member on the ship, apparently), but also two new (female) characters, who sadly don’t add to as much as you’d hope or expect. One, who I don’t even know if they got a name, spends most of the first and part of the second act mostly giving reaction shots when the camera pans over her, leading to a reveal as obvious as it is pointless. And the heavily marketed Jaylah (Sophie Boutella) who is there mostly to give Scotty someone to talk to in the second act, and to serve as the neutral position between Krall’s all-for-one philosophy and Kirk’s one-for-all. Krall also falls into the trap that a lot of villains get these days of having a grand plan but little motivation. The third act, much like Civil War, attempts to blind-rush us with more exposition to make up for the fact that there was very little development in the first two thirds of the film. Krall’s third act character feels like an entirely difference character than the one in the first two acts, either because he was barely a character at all or two thirds of the way through Pegg and co-writer Doug Jung came up with a much better idea but didn’t want to go back and rewrite what they already had. I’ll close by saying that the film looks amazing. I give CGI a lot of (well deserved) flack, and the planet based effects here are dodgy. But the space stuff is gorgeous to a level that might make sitting in a crowded theatre a little awkward. The Enterprise and the Franklin look amazing (though the film fetishizes the Enterprise series to an uncomfortable and vaguely inaccurate degree), but the star of the film is the Yorktown Base. Starfleet essentially built a Dyson Sphere in the middle of nowhere, giving the baddie something to menace other than Earth, and giving the film lots of excuses to show pornographic glamour shots of a curved space city. Unfortunately, the film ends with a loud, obnoxious, unoriginal city-in-peril ending that felt exactly like the ending of Guardians of the Galaxy or any other film that ends with large crowds running through the streets in a general away direction. I enjoyed the film a lot more than I thought it would. My fear that it would be a repeat of what's been done in Star Trek: Into Darkness. But I am glad I was wrong. My favorite moment is when Spock goes through his future self's belongings and finds a photo of the original cast. It got me right in the feels. It was a great moment, made all the better because I consider the Red Jacket era of Trek to be the best. The reboot series still hasn't figured out how to subtly reference the past, but this film struck a better balance between overt and obscured. If Into Darkness was the subtly-equivalent to Die Another Day, then Beyond was equivalent to Skyfall. I share your opinion of the Red Jacket era. The Final Frontier was a bit of a dud but all the other films were great to watch.